Hello, you were probably searching for a Santorini wedding photography and googled your way here. I made this page especially for people like you, so welcome! I am known for destination wedding photography, for the past years i have shot beautiful and inspiring weddings in most interesting places. I truly love destination weddings especially the part of visiting places i have never been before in my life. While you are here, spend some time looking around my website, look through my pages, Destination weddings and Real weddings. You will see that i love to travel so much as i love exciting people and their wedding ideas. 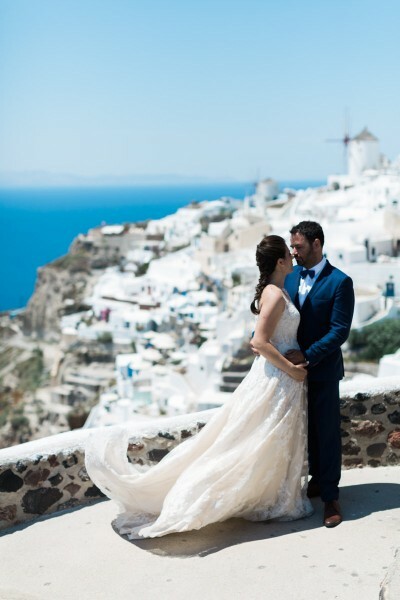 Check out this Santorini Next Day Photo Shoot of a wedding couple. Receiving emails from people like yourself is very exciting for me. And i want to keep doing that. I want to photograph weddings all over Europe. Including Santorini. Check out my latest work, part of promoting weddings in the Athenian Riviera, which refer a lot to sunny, white and blue weddings, inspired by the Greek islands. Bohemian Romance and Dreamy Glamour are two wedding styles that celebrate the truly inspiring couple, getting away from everyday life and getting married in sun washed islands. In other words that is who i am. Why don’t you introduce yourself? I really want to hear from you, your wedding ideas to the smallest detail. Let me know when are you planning your wedding, places, wedding details etc. I want to see if we’re potentially a fit to photograph your wedding, which is why i have set up a short form below. If you fill out the details and provide me with a bit of information, i ’ll get back to you right away (usually within 24 hours) and see if there is potential there for me to photograph your wedding in Santorini.